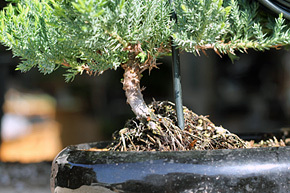 One of the most unique characteristics on a bonsai tree is its movement. 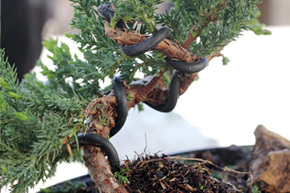 This refers to the bends, curves, and twists present in the bonsai's tree's trunk. When working with your own tree, sometimes the easiest way to achieve movement is to create it on your own using wire. 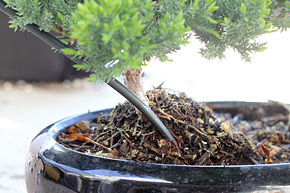 This tutorial will review how to bend a young bonsai tree's trunk with wire. 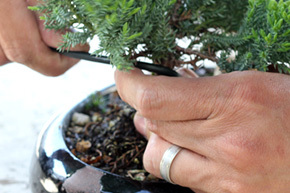 Preparing your tree for bending will make the job much easier and have a higher success rate. Let your tree dry out for a day. 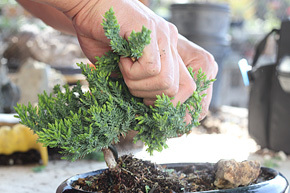 A tree that is freshly watered will snap easily when bending. By letting it dry out, the trunk will be more flexible making it less likely to break. If you want to try an experiment, try soaking a celery in water and then bending it, try it again once it's been left out for a while. To bend your tree's trunk, you'll need to use the correct size wire. If you use a wire that's too small, the trunk won't hold. The general rule is to use a wire size that's 1/3 the thickness of the trunk. Compare the trunk with the wire to help you determine which wire to use. Insert the wire at a 45 degree angle about 2-3 inches into the soil immediately at the trunk's base. 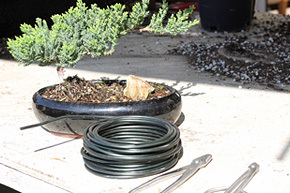 While keeping the wire at this location in the soil, wrap a tight 45 degree coil around the base of the trunk. Do this tightly leaving no gaps between the wire and the trunk. Continue applying wire at a 45 degree angle along the trunk upwards until you reach the end of the trunk at the apex. The 45 degree angle is the key to helping you bend the trunk. Once you've reached close to the apex, you can stop wiring when the trunk starts to taper where it's younger. Cut off any excess wire. Once you've reached the end of the trunk towards the apex, you can cut the excess wire. 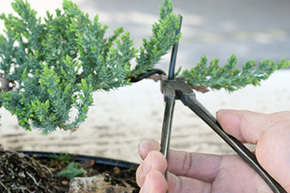 Use a bonsai wire cutter to safely remove the wire without damaging the trunk. Lock your wrists, and use your forearms to bend the trunk and create movement. We recommend creating tighter and closer bends as you get closer to the apex. When working with a thicker trunk, you can also use Jin Pliers. With this more advanced technique you can bend thicker trunk by using two pliers in place of your hands. Once you've finished bending the tree's trunk, you'll need to wait 3-4 months typically for the wire to set prior to removing the wire. If you notice that the trunk starts to eat into the wire, then it's also time to remove it.